Bravo! | Really??! Bravo! – Really??! Why I wear the shirt. Update — 50 for 50.
jillreedsiroty on 50 For 50.
midcenturycurves on 50 For 50.
jillreedsiroty on 14 Years Later. jillreedsiroty on I’m falling apart. loserpies on I’m falling apart. This weekend, I get to be part of an amazing, decades-long tradition at my kids’ elementary school. It’s a fundraiser that nets the school more than $20,000 each year. But it’s so much more than that. 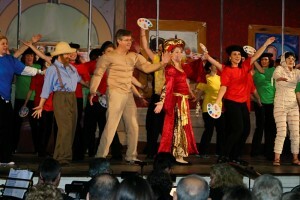 Each winter, the school’s parents perform a full production of an original show (written by a school parent, and selected by a parent committee the previous spring). There’s acting, singing, dancing, a live band, and full costumes. There’s a dance number performed by teachers. Many of us tend to be a generation of parents who put so much focus on our kids and their accomplishments. I love that this show, for just a little while, takes the spotlight (literally!) off our kids. And the kids love seeing their parents perform. We will do three performances this weekend, and some kids will come to all of them to cheer on their parents. Hard work pays off. Depending on what their role is in the show, parents can rehearse several nights a week and on the weekends for the month leading up to the show. For the parents in director or producer roles, the work goes on for nearly a year. But the end result is super cool. Really, Dad CAN take care of you. Many of us moms (whether we work full-time, part-time, or at home) are the primary caregiver for the kids. So, when we’re at rehearsal at night or on the weekend, it shows our kids that we’re not the only ones who can read a bedtime story, help with homework, or make dinner. It’s pretty awesome to try something new. Some of us performed in school plays or dance recitals when we were kids. Some of us were too shy. Some of us were too busy playing sports. The point is, it’s never too late to get up and do something you’ve never done before. This year, one of my friends – a mom of a 3rd grader and a kindergartner – thought it would be fun to perform in the tap number. Even though she’d never tap danced in her life. So she went out as a full-grown adult and bought her first pair of tap shoes. I can’t wait to see it. Making a mistake is NOT the end of the world. This will be the sixth year I’m taking part in the show. And I know that every year, I’ve screwed something up, whether it be a dance move, a song lyric, or missing an entrance. And you know what? Nobody noticed. And if they did, it just didn’t matter. Old friends are great. And it’s also fun to meet someone new. Every year, I get to spend some time at rehearsals with some “mom friends” who I don’t have a chance to see a lot. I also love that I’ve had the opportunity to meet people I might not otherwise have met, because our kids are in different grades and we don’t live on the same street. Oh, and us parents get to learn a few things too. Mostly that it’s okay to act like a kid and have some fun. Let the show go on!